CLIMATE-KIC Start-Up Co-Founder Finalist in Forbes 30 Under 30! Govinda Upadhyay co-founder of LEDsafari, a Climate-KIC Switzerland start-up, has been named one of six finalists in the $1 Million USD Forbes 30 Under 30, Change The World Social Entrepreneurs Competition – the World’s Largest-Ever Contest For Young Social Entrepreneurs. 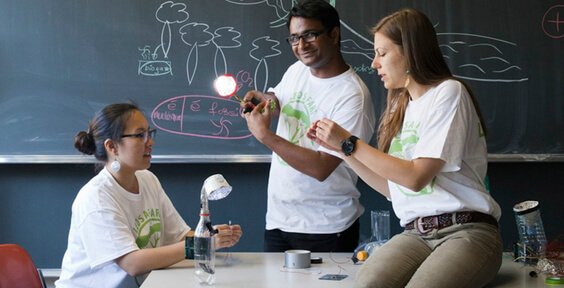 LEDSafari which is in Stage 2 of the Climate-KIC Innovate4Climate Accelerator in Switzerland, has designed an innovative solar lamp which is made up of only five carefully chosen electrical components and which can assembled without prior technical knowledge using locally available material. The focus is on empowering secondary school students not only with the capacity to construct the lamp using locally available material, but with the complete understanding of the science behind the circuit and the design process. “We at LEDsafari are honoured to have been selected as a finalist and really pleased that our approach to empowering people – not just with light but with the knowledge of sustainability and of how to create something essential is reaching so many,” remarked Mr. Upadhyay. While travelling in Indian rural areas, Mr. Upadhyay, who is originally from New Delhi, was confronted with the high cost and complexity of providing light in non-electrified areas. He recognized that this along with many social problems could be solved if local people were involved in the development process. He decided to develop a simple, low cost solar lamp including a training concept with do-it-yourself instructions that also explain the science behind the technology. Mr. Upadhyay a Doctoral Assistant at EPFL (École polytechnique fédérale de Lausanne, Switzerland), began working on the LEDsafari concept while a EIT InnoEnergy Masters student at Eindhoven University of Technology, Netherlands. Upon arrival in Switzerland Mr. Upadhyay and his co-founder launched the start-up and won support through the Climate-KIC Switzerland Innovate4Climate Accelerator. Earlier this year Mr. Upadhyay won the EIT Change Award. “We are grateful for the support we have received. Through Climate-KIC and the EIT we have access to the largest network of cross-sectoral experts (climate, business, energy, education, etc) in Europe,” said Mr. Upadhyay. The six finalists selected from more than 2,500 young social entrepreneurs from around the world, will compete on the main stage at Forbes’ second Under 30 Summit, from Oct 4-7, 2015 in Philadelphia, which is expected to bring together nearly 2,000 transformational young entrepreneurs and game changers. Five of the finalists will each win $100,000, and the overall winner will receive a $500,000 award. Forbes Media is a global media, branding and technology company with a focus on news and information about business, investing, technology, entrepreneurship, leadership and affluent lifestyles. The Forbes Under 30 Summit is an extension of Forbes magazine’s annual 30 Under 30 list – which features 30 game-changing entrepreneurs under 30, 600 millennials, in 20 fields, as judged by some of the greatest minds in each category. Attendees of the summit will be selected from the past four years of this list, which has become one of the magazine’s most popular franchises.